“Compared to the immense stature of this baritone within the French school of singing, Ernest Blanc’s recordings will always be too few to let pass this testimony of his art. 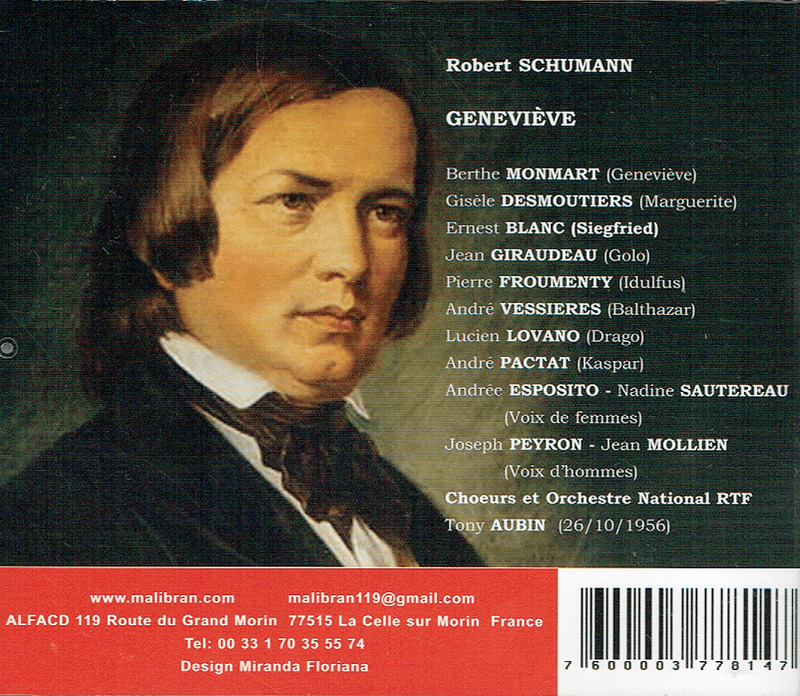 In this radio concert featuring a translated version of Schumann's rare GENOVEVA in French, Ernest Blanc, one of the few French artists to have performed in Bayreuth, sang the role of Siegfried! In 1956, he had not climbed the Sacred Hill yet (his first Telramund would come two years later), but the Paris Opéra debut had taken place, and this 33-year-old artist was already revealing himself in all his majesty. The heroine of this opera is entrusted to a singer whose younger generation was likely to have never heard her name. Yet, she was one of the best French artists of her time. Admittedly, Berthe Monmart did not make a huge international career, it was nonetheless an admirable voice, which was not only illustrated in the national repertoire (superb Louise, excellent Pénélope), but also in the greatest works of foreign composers. Who would want to know her talent, we can not advise too strongly to turn to the Malibran label, without which it would hardly be possible to listen to Berthe Monmart. 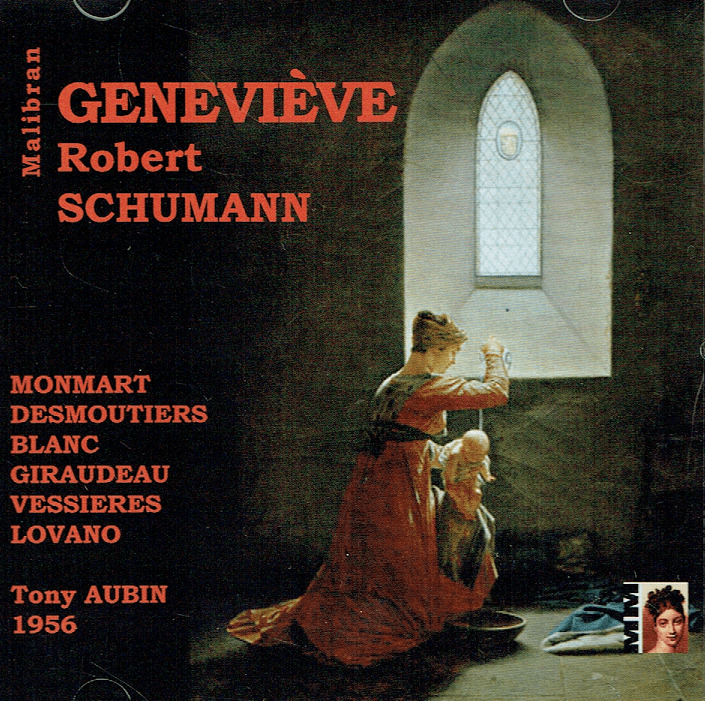 The modest character of Geneviève de Brabant suits her perfectly, and it is regrettable that Schumann did not grant his heroine more ambitious airs. Berthe Monmart shows what a great artist she was, especially at a time when France did not lack great voices. We hear, in tiny anonymous roles, nothing less than Andrée Esposito, Nadine Sautereau or the most beautiful Pelleas of the record, Jean Mollien. 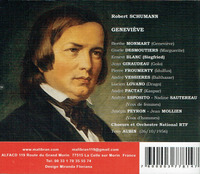 In this GENOVEVA, we also hear the tenor Jean Giraudeau, who shows here the greatest discipline to confer on his song. "Soprano Berthe Monmart debuted at L'Opéra-Comique on 18 April, 1951 as the Countess in NOZZE. She then appeared as Ariadne in ARIADNE AUF NAXOS, Santuzza in CAVALLERIA RUSTICANA, Fiordiligi in COSI FAN TUTTE and Charlotte in WERTHER." "Ernest Blanc, one of the leading baritones of his era in France, made his debut in Marseille, as Tonio, in 1950. He then sang throughout France in the French and Italian repertories. In 1954, he made his debut at the Palais Garnier in Paris as Rigoletto; he sang there as first baritone for 25 years in a wide repertoire (Rameau, Mozart, Gounod, Bizet, Massenet, Verdi, Puccini, etc.). He also appeared often at the Opera-Comique, and was a regular guest at the Aix-en-Provence Festival. His career took an international turn in 1958 with his Bayreuth Festival debut, followed by debuts at La Scala in Milan, the Royal Opera House in London, the Glyndebourne Festival, the Vienna State Opera, the Salzburg Festival, La Monnaie in Brussels, the Grand Theatre de Genève, the Monte Carlo Opera, the Teatro Nacional Sao Carlos in Lisbon, the Liceo in Barcelona, the Teatro Colon in Buenos Aires, the Berlin State Opera, etc. He also enjoyed considerable success in America, at the Lyric Opera of Chicago, the San Francisco Opera, etc. Notable roles included Don Giovanni, Valentin, Zurga, Escamillo, Golaud, Germont, Renato, Amonasro, Scarpia, Riccardo in I PURITANI, opposite Joan Sutherland, Alfonso in LA FAVORITE, Wolfram, Telramund, etc.